This drawstring Knitting Project bag is fully reversible so you get 2 bags in one. 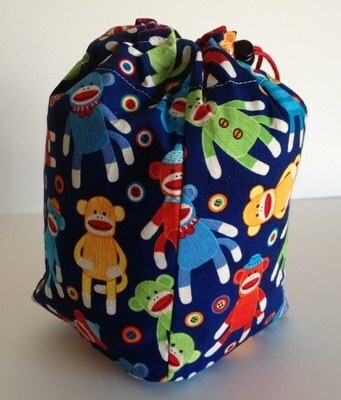 The bag is made from Sock Monkey Fabric and is 100% cotton. The bag has a red lining. As well as your yarn the bag will fit all of your essentials like your double pointed needles, a tape measure, scissors and a small needle case, so you can have your complete project all in one bag. The bag features a pocket made from the same Sock Monkey fabric if you want to keep your notions separate from your yarn.